The Malazan Book of the Fallen series (10 books in total) has, to be honest, been on something of a hiatus on my reading horizons this last year. Book 1, Gardens of the Moon slapped me in the face with an uncompromisingly complicated plot, and a complete lack of exposition. Who were these people? Who were these other people? What were they doing? How were they linked? Why were they fighting?, and etc. Having been spoon-fed the backstory on a number of recent reading endeavours, it was refreshing to find an author whose basic version of narration was ‘sink or swim’ and didn’t appear to give a damn which way the readers went. That said, I soon gave up trying to swim against the current, and simply let the stories carry me along, a result of which was not remembering many names, and instead picking the characters by the context of the narrative thread in which they roamed. The scope of series is geological in its timescale, and roams at will through worlds and warrens (magical semi-universes, accessible only by using that particular branch of magic). Some characters have existed for millennia; others have been created freshly from the traumas of war. Gods can be killed, and mortals can ascend to deityhood. A sword is simultaneously a gigantic cart, to whom are chained the souls of its victims; they drag the device on, in an endless toil to escape the forces of chaos which eat away at their heels. It is an amazing series, and owes more of its influence to fantasy roleplaying games than to Tolkien’s ilk. Unfortunately – or fortunately, for the craftsmanship of the novel – Erikson shows a positive fondness for making one fall in love with a character, and then, one book or five later, killing them. A sense of despair and pathos imbues the otherwise workaday scenes of battle with the angry futility of a veteran, orphaned by the vicissitudes of war. As a result, I only just returned to complete the tenth book, The Crippled God. It was everything I hoped for; some of my most recent favourites even survived the novel, and I witnessed the return of the Master of the Deck of Dragons, whose company I had missed for the preceding few novels. True to reality, the final battle of The Crippled God simply meant the end of war for some of the characters; they are left to find their own happy endings, but a vignette with one hoary old Bridgeburner at the end reminds the reader that there is always another war brewing, and another young fool yearning to die for glory. It was a difficult series to understand, because it really is one constant, dragging, battle from start to finish. Possibly the best way to visualise it is this: imagine a fantasy boardgame. Populate it richly, with fantastic cultures and creatures. Give the armies names. Then, using many-sided dice, march them across the world you have created, and write down every battle fought, the death tolls from fighting and from forced marches through deserts or rents in the fabric of reality. Repeat this process six or so times. And then layer them atop one another, and create Malazan Book of the Fallen. K.L gives The Crippled God 4 out of 5 well-drawn world maps. I’m sorry. I’m just so excited. Tehol survives! Brys survives! Udinaas survives! Onos T’oolan gets his family back! Yaaaaaaaay!! But really. I’m still pissed. How could you kill Anomander Rake?! I’ll never forgive you for that, Erikson. 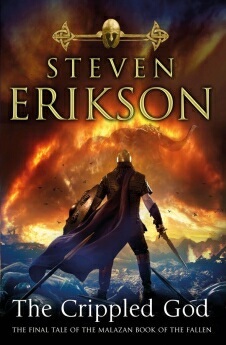 This entry was posted in Fantasy and tagged anomander, crippled god, epic fantasy, erikson, fantasy, malazan, malazan book of the fallen, steven erikson. Bookmark the permalink.